“These Regional Award ceremonies are really exciting as they give everybody a chance to hear each other’s stories, hear about where they came from, share what they’ve been through to get to where they are. And to talk about all of the great work that’s been done in the last year, along with all the recognition that everybody has earned” explains Justin Cobb. 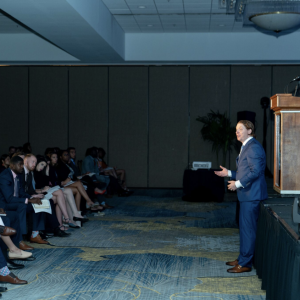 Vice President of his organization and self-made entrepreneur Justin Cobb kickstarted this year’s Midwest Rally with a ton of energy and, as always, with his passion for his work, his business partners and for everything they have built together. Justin’s compelling opener focused on the power of making people feel your words — making people feel every word that comes from your mouth. Justin went into great detail about what happens when people feel whatever it is that you say you’re going to do, “It’s making an impact. When everything that is in your heart, is coming out of your mouth, then that’s when you’re making an impact. Part of making an impact is just letting rip, giving it all you’ve got and making people feel how you feel — they might not remember everything you said, but they will remember how you made them feel. That’s the key. It’s why our clients hire us, and it’s why we attract people who want to work with us” said Justin Cobb. Justin Cobb emphasizes the importance of being impactful in everything that you do, “The definition of making an impact is changing the speed or direction, the person or the thing, the place or an idea. Once you learn how to make an impact, there’s this balance between pouring everything into it and going for it, and promoting your goals, and saying what you’re going to do, and then secondly, you have to find indifference. There has to be some aspect of not giving a f**k what the result is. You have to lock in every conversation you have, assuming the best and when it doesn’t work out — and it won’t work out 95% of the time — you’ve got to move on in a heartbeat, it doesn’t matter. Not everyone is going to buy into what you’re saying, always cater your speech and what you’re talking about to the highest person you’re trying to attract to your business. So don’t ever stop your dreams and put them down because your worried some people won’t believe in them. Say what you feel and say it with conviction and say it with heart, the only way people will believe your words, is if you honestly believe them yourself, and eventually, the right people will feel them.